More Than 750,000 Could Lose Food Stamps Under Trump Administration Proposal The Trump administration has proposed changing food stamp rules to require able-bodied adults without children to work 20 hours or more a week or lose benefits. The Franciscan Center in Baltimore serves a hot lunch daily to those who need extra help, even if they receive food stamps. Those benefits could end for 755,000 able-bodied adults. Those affected by the proposed changes to the Supplemental Nutrition Assistance Program benefits are known as able-bodied adults without dependents, or ABAWDs. There were close to 4 million adults in this category receiving food stamps in 2016. About three-quarters of them did not work, according to the U.S. Department of Agriculture. Agriculture Secretary Sonny Perdue says the administration thinks these people should be able to get jobs, especially now that the nation's unemployment rate is the lowest it has been in years. "We believe the purpose of our welfare system should help people to become independent rather than permanent dependency," he recently told the House Agriculture Committee. "We think we are helping people to, again, move into the dignity of work and the respect of providing for their families." To do that, the administration would stop food stamps after three months for ABAWDs who don't work, volunteer or get job training for at least 20 hours a week. That's already the law, but many states waive that requirement in high unemployment areas. The Trump administration would make those waivers much more difficult to come by. It's part of a broader effort by the administration to impose tighter work requirements on recipients of government aid, such as housing vouchers and Medicaid. A federal judge last week blocked two states, Arkansas and Kentucky, from implementing the Medicaid work rule, calling it "arbitrary and capricious." But the concept has strong Republican support. "People believe that able-bodied people who can work, should work," Tennessee Republican Rep. Scott Desjarlais told Perdue, "Do you have any idea why there might be so much pushback and concerns on this measure?" "I have no clue," Perdue responded. At the Franciscan Center in Baltimore, where low-income individuals come every day for food, clothing and other help, people think they have a pretty good idea why opposition is so strong. 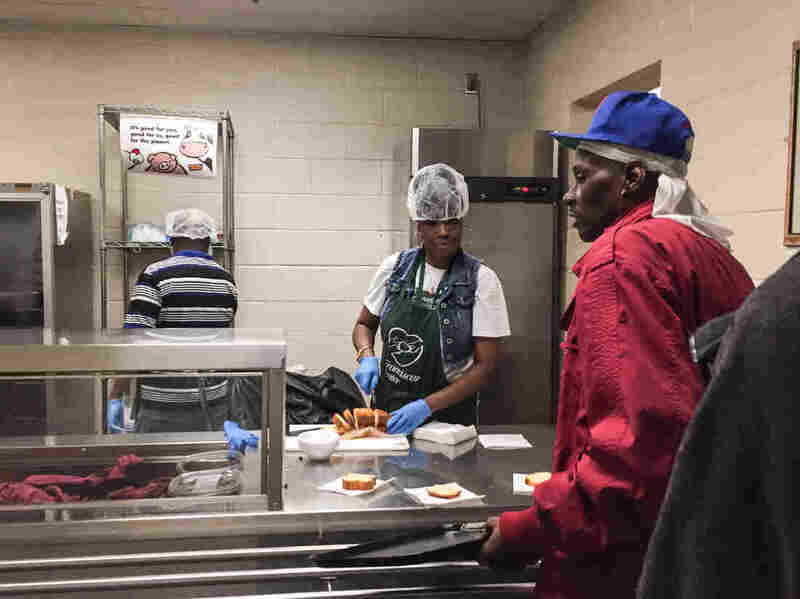 "Right now, I'm literally dependent on places like this," says 41-year-old Alton Royal, who carries a small plastic bag containing a couple of rolls and two peanut butter and jelly sandwiches. "This is my meal for the rest of the day." Alton Royal of Baltimore depends on food stamps but fears he will lose them under the proposed rule because he can't find a job. Royal says he gets $185 a month in SNAP benefits, but he worries he'll lose them under the proposed rules because he can't find work. He has a severely injured leg and a criminal record, which limit his options. "But still I have to eat. I have to still try and find employment but I have those barriers against me," Royal says. Others here are struggling with other barriers, such as homelessness, mental illness and drug addiction. Some already work, but not enough to meet the 20-hour-a-week threshold. One man says he has a janitorial job at the Baltimore Orioles' stadium, but only when the baseball team is in town. In the winter, he relies on food stamps. "Everybody I know wants to work," says Royal. "Everybody." 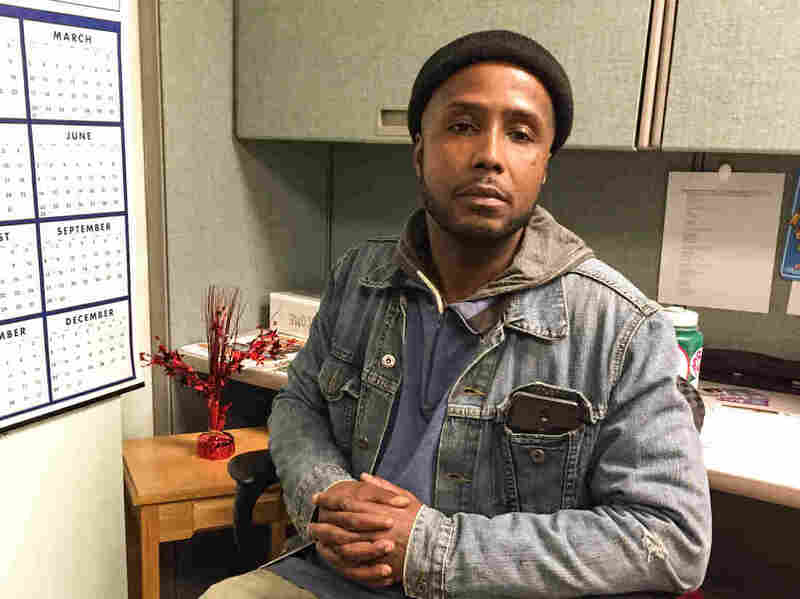 Michael J. Wilson, director of Maryland Hunger Solutions, an advocacy group that opposes the rule, says threatening to take people's food away won't help them get a job. By the administration's own admission, the change would save $8 billion over five years, largely because 755,000 individuals will not meet the new requirements. Wilson estimates that about 30,000 of them will be in Maryland. He says that it's not just the lack of jobs, but the lack of other options. "If all those folks showed up at a job training site tomorrow, they would swamp the offices," he says. "There's not enough space for them to be able to do this." Perdue notes that there would be exceptions for those who are disabled or can't work for one reason of another, but it's largely up to the states. States are not required to guarantee an individual a job, training or volunteer opportunity before stopping their benefits. Looking for work only counts toward the required 20 hours if it's paired with an education and training program. "This idea that people are ripping off the system or something, that's just not true," he says. In fact, food stamp benefits are structured to encourage work, he says, by reducing benefits gradually as income grows. Gundersen also says the proposal "is just not consistent with the goals of the program," which is to reduce hunger. For the most part, SNAP has enjoyed strong bipartisan support. A similar work requirement was rejected by Congress last year when lawmakers debated a new farm bill. President Trump announced the proposed rule the same day he signed that bill into law. As a result, congressional Democrats have threatened to sue if the change goes into effect later this year, as the administration intends.